Computer scientist Jaron Lanier decries the Internet’s huge claim on modern life. Those inexpensive Internet services we’ve come to love are costing us a fortune. Google, Amazon, and Apple make information and entertainment cheaper than ever, but brick-and-mortar retail stores, music recording companies, publishing companies, and newspapers pay the price. As Internet companies earn billions, thousands of middle-class jobs disappear. 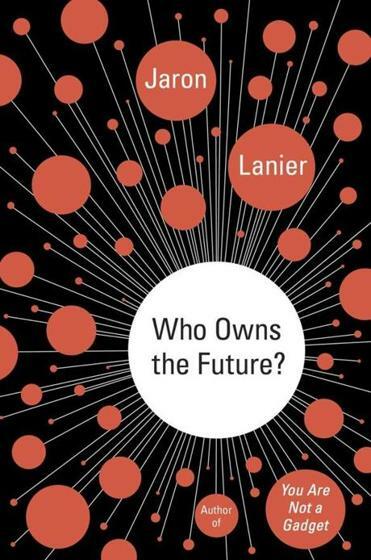 It’s bound to end in tears, warns computer scientist Jaron Lanier, and in his new book, “Who Owns the Future?” he suggests a radical solution. But after nearly 400 pages of meandering and often bewildering prose, we’re left with the barest outline of a coherent plan. Lanier gets off to a promising start. He notes that in any reasonably fair and just society, the fruits of the economy ought to be distributed in a manner that resembles a bell-shaped curve. A relatively small number of people on the left end of the curve get by on very little money, a very small number rake in billions on the right end. The rest of us live in relative comfort and security somewhere in the middle. Transformations in the economy, like the rise of the automobile or steel industries, pour vast new wealth into the hands of entrepreneurs and investors. The rich get much richer, but the great majority may see their incomes decline, as their jobs, businesses, and investments are made obsolete. It’s as if the bell curve tilted and a gush of liquid gold drained to the rightward edge. Societies have prevented this process from going too far by erecting what Lanier calls “levees,” little dams of social and economic policy that protect the wealth of the middle class. Labor unions are such a levee; so are antitrust laws, academic tenure, tax policies that encourage home ownership. The rise of the Internet has created a new way to direct vast amounts of economic value to a new generation of brilliant entrepreneurs. Their wealth comes from their control of what Lanier calls “Siren Servers.” These are computers like those of Google and Facebook, machines that deliver extraordinarily useful services, usually for little or no money. Like the sweet-singing nymphs of Greek mythology, the call of the Siren Server is irresistible. At Facebook you can share your life with friends old and new; Google lets us access the accumulated knowledge of the world with a few keystrokes; Apple and Amazon let us purchase digital music and electronic books for just a fraction of what we once paid for the analog versions. Siren Server companies have made themselves astoundingly wealthy. Google, for instance has a stock market value of $300 billion, nearly seven times that of General Motors. But even in its present diminished state, GM employs about 202,000 well-paid workers, while Google’s workforce is a mere 53,000. And the traditional levees have proven useless against businesses that rely on a handful of brilliant scientists and engineers, rather than legions of less-talented folk. Digital music and book sales have ravaged traditional producers and slashed thousands of good-paying jobs; free online news and classified ad services are putting old-school newspaper men and women on the street. Nearly all the resultant economic benefit goes to the owners of Siren Servers; little of it flows to the rest of us. Well, that’s life under the free market. Or is it? Lanier notes that Siren Server companies profit from the uncompensated economic value generated by other people. When Google or Facebook hits you with an ad customized to your tastes and interests, they’re using information you gave them. So why shouldn’t they share the economic value of that data, by paying us for its use? Lanier envisions a radical overhaul of the Internet economy that would let us retain the benefits of the Siren Servers but spread the wealth that they generate. We’d stop getting online services for free; companies like Google would charge something for their offerings. But in addition, they’d pay users a steady stream of income in exchange for the information they collect about us. In Lanier’s world, our personal information is recognized as private property. Any business that wants to use it — Google, Amazon, your cellphone carrier, your bank — would have to pay for the privilege, sending you a few bucks every time. Even the cops would have to pay you if they subpoenaed your cellphone records. Indeed, Lanier’s plan has a clever side benefit — it protects our privacy by making it costly to spy on us. But how would you set up such a system? How would you manage billions of dollars chopped up into billions of micropayments? How would you store and protect each person’s private data? How would you ever persuade today’s Internet giants to adopt your system? On all these matters, Lanier offers hardly a clue. By his own admission, he hasn’t thought it all out yet, which explains the book’s rambling and ill-organized style. Too bad. We desperately need answers to the problems described in this fascinating, frustrating book. But you won’t find them here. Hiawatha Bray can be reached at h_bray@globe.com.